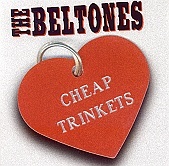 The Beltones' start of the majority of their songs in a punchy, highly melodic, almost pop way before the ultra gritty, snarling vocalist jumps in and the band blasts into punk that is so fast it could set ablaze to anything in its way. From there the band rips, tears, and pulls on you, throwing you around like a doll as the roaring punk rock demolishes everything in its way. This is street-smart '77 pogo punk with a slight melodic tint to keep things interesting. I'll give it a B.